Heal Your Puzzle » Blog Archive » Systems vs. Networks… Do You Recognise the Part You Play? Systems vs. Networks… Do You Recognise the Part You Play? This may look like a computer science article at first glance but we (our body and brain) actually use these structures (systems and networks) to function within ourselves. They also affect not just You but also your Family, our Communities and the World. Firstly, we are electrical Beings with a nervous system sending electrical messages all around the body and feeding back to the brain, your neural network, for processing and decision-making. 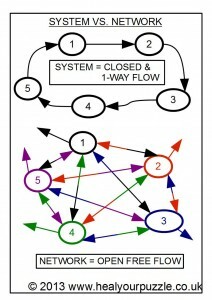 In brief, a System has one-way flow of information in a loop, each part (ref. 1-5) receiving information, processing it in its own way and then feeding further information onto another part. For the whole System to continue to function reliably, each part has a role to play. A Network operates as a collaboration of parts, each of which act independently. Information is shared and is more like a conversation than a set of commands and responses; each part can choose the connections it makes and this is why we as humans learn and adapt – our brains are making and breaking connections all the time, building on mechanisms that work and redesigning those that do not. Complexity increases as Networks can be part of larger Systems and vice versa and infinitely layered as well. As we grow from children into adults we learn to interpret and create these structures; they become our identity, our behaviour, our expectations and aspirations, our well-being and our ill health… Each of us will have our own innate ability to manage up to a certain level of complexity depending on our genetics and our life experience but this can also be learnt and developed. The challenges we each face today on an individual level are an opportunity to move into this higher level of understanding. How does this affect my Family or Community? As you grow in yourself you interact with others and how this occurs depends on the subtle energy systems and networks around you. It works in exactly the same way as above but on an increasingly larger and more influential scale; each part above could be a person, a country, a political system, a culture, etc. In themselves, these are just ways of relating, helping us to grow and develop and providing us with support. On the flipside however they can also become manipulative and limiting. This is where the growth of the Internet has been revolutionary and very large Networks have formed where before there were only highly influential Systems; this has allowed independent thought and collaboration and a rapid change in the Global Society unprecedented before. The future is up to all of us to decide… ‘step outside your box’… be the change 🙂 How exciting is that?